New in this season are pinks and golds. 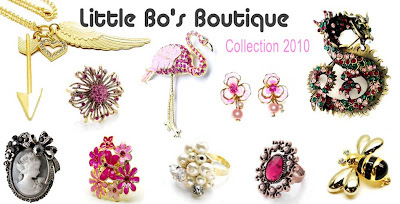 Adorable pink flamingoes, super cute bees, fantastic pink and amethyst dragons, stunning fuchsia starbursts and classic cameo brooches are now in stock at Little Bo's Boutique. Add extra glamour to day or night wear with beautiful pink flower and butterfly rings, CZ and pearl cluster rings, or antique style hot pink gem rings. Team this up with gorgeous pink orchid flower earrings. Finally accessorize a February outfit with this matt gold cupid's arrow and angel wing heart necklace.